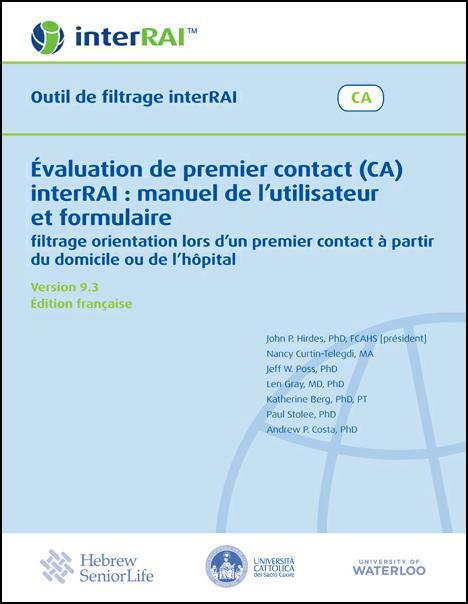 The French edition of "Évaluation de premier contact (CA) interRAI" is translated from the English "interRAI Contact Assessment (CA) Form and User's Manual: A Screening Level Assessment for Emergency Department and Intake from Community/Hospital." The interRAI Contact Assessment (CA) is based on a modular assessment instrument that provides information to support the home care assessment intake and emergency department referral processes. The assessment form begins with a shared demographic section and then directs assessors to either the Community/Hospital Intake module (a home care intake assessment for persons in the community or hospital, including the emergency room) or the Emergency Department Screener module (which supports referral decision-making for primary care staff in the emergency department). These assessments should be completed electronically in order to provide instantaneous results for the clinical algorithms and indicators embedded in the CA instrument. The CA is not a substitute for a comprehensive interRAI assessment. It records only essential information needed at the time of intake to support decisions regarding the need for more comprehensive assessment, the urgency of home support service provision, and the need for specialised services. This book contains introductory material, an item-by-item guide to completing the assessment form, and the assessment form itself. The French Edition has been customized for France, and the French language used in this publication is native to France.